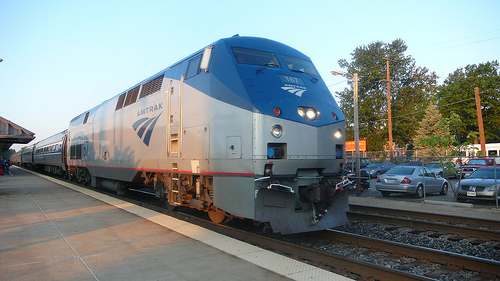 Service Costs > How Much Does Amtrak Shipping Cost? How Much Does Amtrak Shipping Cost? Amtrak Express is a cheaper freight shipping service and its rates, according to those who have used it, are generally inexpensive compared to FedEx and UPS. Amtrak offers its shipping services for packages, even when no passenger is accompanying the packages. Amtrak will ship virtually anything, provided that it fits into the luggage and isn’t illegal, explosive or dangerous. How much does Amtrak Express shipping cost? The cost of Amtrak freight shipping is based on the total weight, size, and distance of shipment; however, in some instances, you will pay half of the other express delivery services. On average, the shipping rates range between $49 and $67 for the first 100 pounds. Additional weight can cost $0.46 to $0.57 per pound. The quoted transit times vary from three to seven days depending on the distance and service frequency. According to a blog post on Transitized.com, the initial 100 pounds for his trip was $60 and each additional pound was about $0.57. A forum member on TheCabe.com also logged his experience with shipping his bike on Amtrak, saying he spent $15 for the bike box and another $80 for shipping from Southern California to North Carolina. Bikes, a common item often shipped via Amtrak Express, can cost close to $60 to $80, regardless of your destination. As a bike weighs close to 100 pounds once boxed, it can be safe to say it’s within the estimate mentioned prior. Bike boxes, if you were to need one, are available at Amtrak for about $15. At PedalShift.net, for instance, the author said he paid about $76 to ship his bike from Sequoia to Washington D.C.
Once your shipment arrives at the Amtrak station, you will have up to 48 hours to claim it. In case you fail to do so within that time, additional storage fee will be charged. Amtrak will hold the package for an additional $3 per box per day. Amtrak provides optional insurance, up to $2,000. For every $1, they will provide $100 worth of coverage. With Amtrak, you can ship your luggage to more than 100 Amtrak locations. The only thing you need to do is simply drop the package off at a participating Amtrak-station and the recipient will pick it up in the destination city. Boxes up to 50 pounds/36-inch x 36-inch x 36-inch, suitcases, as well as boxed bicycles are acceptable. Large pallet shipments of up to 500 pounds are accepted at certain major Amtrak stations only. Shipping can take up to one week. Certain items, such as perishables, artwork, breakable/fragile items, furniture, glass, tools and appliances (including the small kitchen appliances), are not accepted. Electronics are not accepted, either. The size and weight limits do apply and your entire shipment cannot exceed 500 pounds, according to the official website. Luggage must be checked no less than 30 minutes before the departure of the train. If you have over 500 pounds of shipment, you may have to break it up into several shipments over a number of days. The packaging requirements are that the packaging should be addressed and in sealed cartons. Amtrak Express service isn’t a door-to-door service, but the additional effort to get to the train station can save you a lot of money. Before you begin packing, you should contact Amtrak. They can inform you what Amtrak stations offer the service, verify that what you would want to ship is allowed and give up-to-date pricing information. They will also tell you where exactly to drop off your stuff. Normally, it is a loading dock which may be tucked on a building’s backside. Service and hours vary by station and is limited by the available equipment and with security considerations. The service is not available at all the stations. If using the service, Dolly.com highly recommends labeling each box with your address and contact information. Be sure to compare quotes with other providers such as FedEx Ground, UPS Ground, FedEx Freight Economy, UPS Ground Freight and the United States Postal Service.